Our experts offer creative and smart solutions in data integration that are availed in certain formats to easily satisfy business sector needs. Such services are marked by compliance with highest standards of trust, security and privacy. We focus on our solutions and services to be compatible with our customers’ technological systems relating to different work activities. With experienced and qualified team of experts and consultants in technical and supporting areas of work relating to business and commerce in Ethiopia, we provide our customers with a range of consultancy services. This includes organizational consultancies and integral solutions in addition to human resources that support our customers to achieve their objectives. (Mangedco) for business-related services. Since its inception, has been an outstanding corporation offering smart solutions and creative services for business sector in Ethiopia. With its ambitious vision to lead innovation in smart solutions and driving change, (Mangedco) seeks to offer high-quality services built upon creativity, and executed by skilled work teams in an effective work environment. One of the main reasons for our success, appears in employing national distinguished competencies and following institutional methods that comply with highest standards and best practices known worldwide. This is basically meant to satisfy our customers’ needs helping them to achieve their objectives. Since the early beginning, we have adopted the concept of smart solutions and creative services in an innovative work environment along with highly skilled teams that are capable of coping with development changes and initiatives for supporting our customers and providing them with high-quality services. 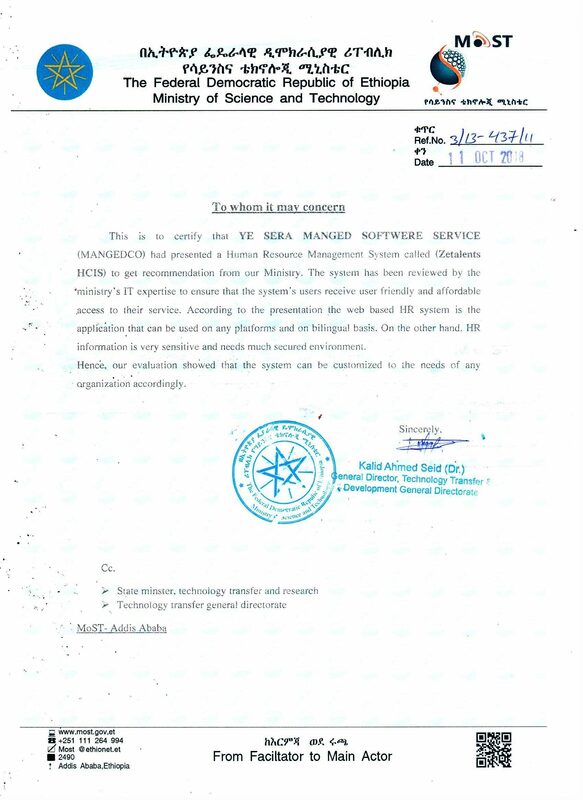 We received a Recommendation letter from the Ministry’s of Science and Technology for Our SYSTEM.